The upcoming Indian elections will have a tremendous impact not only on the bilateral relations between the two great nations, but also on the entire geopolitical scene in Asia. Against the background of the tumultuous events in close proximity to the Russian borders, the forthcoming change of power in India seems to be something distant and insignificant for Russia at the moment. However, if we look at the prospects, we must admit that the upcoming Indian elections will have a tremendous impact not only on the bilateral relations between the two great nations, but also on the entire geopolitical picture in Asia, and therefore on the whole world. Today, only few observers doubt that the BJP will win in the upcoming April-May general parliamentary elections in India. However, almost everyone is convinced that the party will not receive an absolute majority of seats in the future parliament, and hence Narendra Modi’s premiership does not look as guaranteed as his party’s relative victory. Nevertheless, Modi still remains the most likely candidate for prime minister. This is ABC. It is much more important to try to understand what will happen after the elections, and how India's relations with the outside world will be shaped if Narendra Modi becomes Prime Minister. Certainly, the choice of the future government’s course – is strictly an internal affair of India and outside observers can certainly express their appraisals, but they have no right to influence either the voters’ will or the future course of the people's elected representatives. As for the domestic policy of Narendra Modi’s future government, I will allow myself to express only two concerns. The first one, expressed by many observers in India itself (mostly by Modi’s opponents), is that his premiership could exacerbate the split in the Indian society – both in the interfaith relations, and the relations between the centre and the regions. Especially now, when the region's leaders are gaining momentum, centrifugal tendencies are manifested more clearly, and a growing number of states territories declaring their assertiveness. However, nobody knows how what direction this process will take in the future. Modi and his supporters are obviously aware of this danger, and therefore it is not by an accident that they built their campaign largely by demonstrating their economic achievements by the Gujarat state, during the 12 years of Modi’s administration as chief minister. However, here is the second concern: to what extent can a single state’s experience be extended to the whole of India, especially considering the centrifugal tendency noted above and the possible opposition from the regional leaders who are gaining power? However, I repeat, all these issues are within the competence of Indian voters and the future government. What concerns the entire world without exaggeration is the question of India’ foreign policy, with Narendra Modi’s possible premiership. As a rule, India's foreign policy does not vary too much depending on which party forms the government. However, the current situation is very different from that observed in the previous years. To begin with, the most unprecedented ever harmonization with India and USA occurred in the two terms of Manmohan Singh’s acting as prime minister. This was particularly noticeable during the presidency of George W. Bush and was manifested in the so-called “nuclear deal,” which opened the way for broader cooperation between the U.S. and India not only in the field of nuclear energy, but also on a wide range of issues, including military and technical cooperation. And while Barack Obama is undoubtedly a weak President, who is ignorant in the foreign policy matters, even when compared to his predecessor – he somewhat weakened his attention towards India, and did not abandon any attempts to bind this country to his own foreign policy. It is well known how it ended for the country as a whole and for the government of Manmohan Singh in particular. Having literally twisted the arms of the Indian government, the U.S. administration induced it to support the sanctions against Iran. As a result, India reduced its import of Iranian oil by 15 percent. First, this led to an increase in fuel prices inside the country, which caused a chain reaction in the entire economic system - an increase in prices on goods of consumption, a sharp fall of the rupee and a lowering of the GDP to a level much lower than is considered – down to 6 percent per year. Against this background, today virtually no observers predict that the ruling Indian National Congress will save its majority or even have a significant representation in parliament. And, of course, the “American direction” of the Indian foreign policy with Modi as prime minister is exactly where we should expect the biggest change. Over the last few months, Washington seems to have demonstrated that it is not willing to soften its position towards a visa ban on Modi. They may not have a choice if he becomes prime minister. We must also take into consideration that Modi himself is unlikely to quickly forget the wrongs that have been inflicted on him by the State Department, by repeatedly denying him a visa for his alleged involvement in the 2002 riots. Perhaps, we should not exclude the United States attempts to organize something like a ‘colour revolution’ in India if the voting outcome does not suit Washington. Especially as there is a cultural medium for mass street protests in India, and there are also politicians who gained their experience from holding such protests. If American political strategists try hard, they may be able to send the people’s valid indignation at the level of corruption in the direction suitable for them just like they did in the Arab countries, and like in the recently sponsored successful coup in Ukraine. Coming Next: Russia cozying up to BJP? 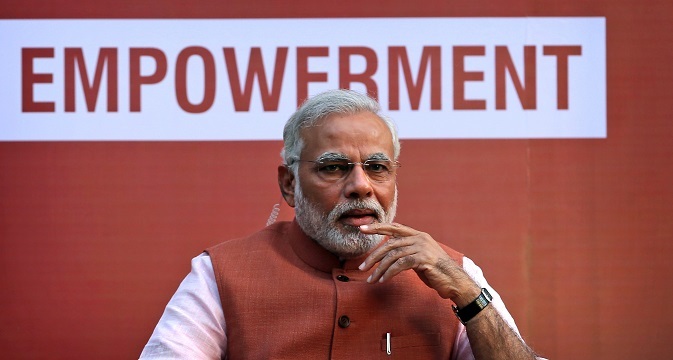 The second question that arises in connection with a possible line of India 's foreign policy if Narendra Modi becomes prime minister is the way the relations will develop with its immediate neighbours, especially Pakistan and China. This is where the two factors collide. On the one hand, the BJP leaders fairly and reasonably point out that these relations were best developing during the premiership of Atal Bihari Vajpayee, who also represented this party. On the other hand, the image of Modi as an “anti-Muslim” politician and a “hardliner” is likely to create some problems in the relations with countries that are not just India's neighbours, but its geopolitical rivals. Then a lot will depend on Modi’s behaviour. Will he continue to play up to the radicals’ expectations, which constitute a substantial part of his electorate, or will he realize that India’s national interests are in fact above all others, and the slogan India First is not just a loud phrase thrown at voters ahead of the elections, but is a long-term strategy designed not only for the upcoming five years, but also for the future decades. If that happens, it opens a completely new perspective of building relationships not only in the South, but also throughout Asia. Given the fact that this is the part of the world where the centre of world politics moves today, it would mean a formation of a new global geopolitical architecture. If India realizes that following in the wake of the “big brother” policy, when put mildly, does not fully meet its national interests, it is the government headed by Narendra Modi that will be able to build relations with close and distant neighbours in Eurasia (including not only China and Pakistan but also Iran, Russia, Japan, Vietnam, and other countries), which will strongly weaken the bloc confrontation in this part of the world. That would mean a departure from the “zero sum game” and the transition to a situation of universal benefits (win-win situation).